Zanzibar gem (Zamioculcas zamiifolia): growing, planting, caring. Tropical brought to your home ! Zamioculcas zamiifolia - the Zanzibar gem, Zuzu plant or Emerald palm - is a the single species of the genus of flowering plant Zamioculcas in the family Araceae. It is a tropical perennial plant native to eastern Africa, grown as an ornamental plant and mainly as a houseplant in temperate regions, mainly for its attractive glossy foliage. 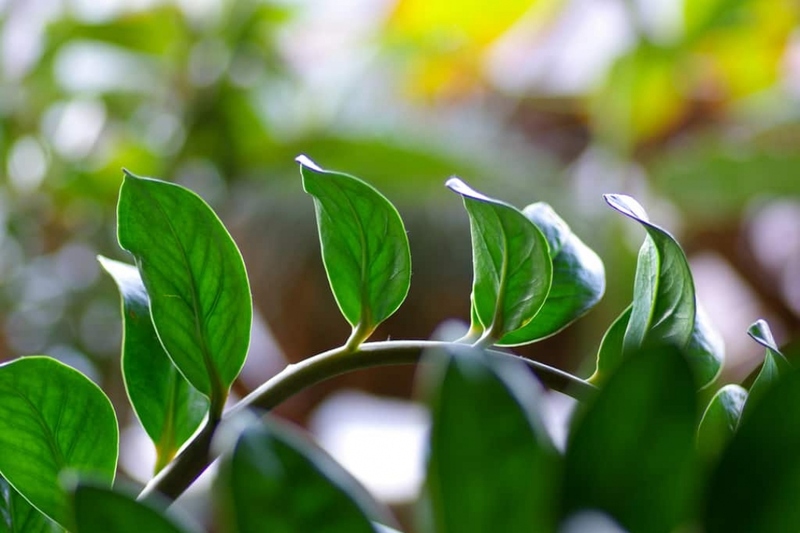 Zamioculcas is a tropical perennial with a very simple habit, with erected compound leaves that emerge directly from the rhizome and have alternate leaflets. These are between 5 and 15 cm long and have a glazed appearance. Flowering zamioculcas occurs rarely in the apartments, and these flowers are greenish brownish, rather sparse and discreet. The inflorescences measure up to 20 cm. Zamioculcas fits pretty well inside our homes and apartments. It will grow well with a temperature of 18-22 ° and needs light. It can however spend the winter around 16 ° C. Be careful: avoid placing it directly behind a window to the south, the direct exposure could over dry it. Prefer the proximity of a window facing west to bathe it in brightness. Plant in a mixture of potting soil, fibrous compost, and sand, in a pot about forty centimeters. Water the soil until it is properly surrounding the roots. Use rainwater, or at least non-calcareous water. Do not let the water stagnate in the saucer, it causes the leaves to blacken and makes the plant rot. In season, water twices a week, then space gradually until watering only once a week in winter. At the end of winter each year, repot your plant in a pot slightly larger than the current, with a mixture of sand, compost and fibrous compost. Do not hesitate to take out your zalmoculcas for the summer! Just avoid placing it directly in direct sunlight - acclimate the most gently, and of course, watch the watering! Put them back inside at the end of summer. Summer is over! Bring in your zalmoculcas, they are sensitive to frost. Once a month between April and September, pour some compost juice into the water, without excess. You can use chemical fertilizers for indoor plants.